This week, the junior and senior dancers at Idyllwild Arts Academy will showcase their choreography talents. The same shows will run Wednesday, Thursday and Friday nights at 7:30 p.m.
For me, choreography has always been the “brains” behind the physical side of dance. You could have beautiful, talented dancers, but if the piece wasn’t interesting, then it didn’t work. 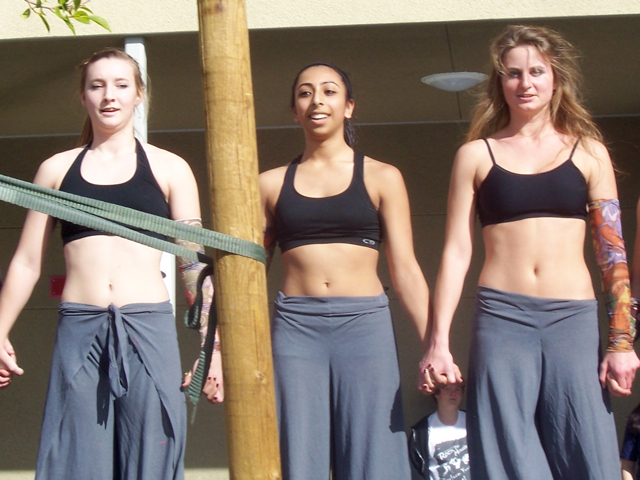 Lucky for all of us who attend the dance performances at Idyllwild Arts, the choreography has always been top notch. However, I took it for granted, until just recently. Eight dancers from Idyllwild Arts were invited to perform a modern dance piece at The Colburn Shcool’s Spring Dance Concert on May 7. The students included: Adrianna, Gina, Giovanna, Madison, Michelle, Gerard, Annalise and Morgan. Maybe it was the fact that the program was heavily laden with ballet numbers (eight suites from “Coppelia” started the show). But when the eight dancers from Idyllwild Arts took the stage, it was a like a breath of fresh air. “Here come the professionals!” the other driver whispered to me. “Episodica,” choreographed by Stephanie Gilliand and dancers, opened with a bold, red backlight. In silhouette, three dancers began pulling, twisting and contorting their T-shirts in many ways as they moved across the stage. The backbeat of the music was strong. There was a hushed silence from the audience, just like the start of many Circus de Soleil events. The T-shirts took many forms, from pregnancy to a shroud. Did “Episodica” have political undertones? Was it about transitions? Transformations? No one knew for sure. Throughout the next 10 minutes, each of the dancers ran from the sidelines, leaped into the air, and pulled and pushed each other. Some looked like physical struggles, while others personal agonies. At one time, all of them were lying down on the stage, while one pulled herself up from the carnage. During intermission, the students all got into the van, talking enthusiastically about the experience. It was good for them to perform on another stage and before a new audience. Instead of being tired, they were elated. Many of them had started the day taking the four-hour-long SAT test. No one knew what “Episodica” was about, but said that they had performed it once before at their own Spring Dance Concert. I longed to ask Stephanie what her motivations were for the wonderful choreography. How long did it take to create it? And did it change after it was performed? Was it a challenge to create such a fast-paced piece? Some of the dancers began talking about the Student Choreography dances that will be showcased starting Wednesday, May 11. Each of the juniors and seniors who created the dances got to hand select their dancers. Most will create a piece and dance in two more. If last year’s student choreography was any indication, audience members are in for a real treat. Each piece was as diverse as the dancers who created them. Some showcased traditional tango, while others were moody dream sequences. One paid tribute to a friend who was recently expelled, while another featured inmates in an insane asylum. (See “The Brains Behind 13 Dances” blog entry dated May 16, 2010). The beauty of living in a creative environment like Idyllwild Arts is that students can draw upon the talents of their peers. For Olivia’s piece, Ryturo and Mitch, both theater majors, will be dancing hip hop. “I choreographed the hip hop part, while Olivia choreographed the other dancers,” Ryturo said, before going to Tuesday’s technical rehearsal. Ryturo was excited about dancing hip hop again on stage. He started when he was about six years old in Singapore. Mitch just started a couple of years ago, Ryturo said, but he’s pretty good. The two will add an edgy element to Olivia’s choreography. For Wills piece, he asked his friend Kai, a film major, to mix his music. “We took about five Lady Gaga songs and made them sound like one,” Kai said. Will, who has dressed as Lady Gaga for Halloween before, will showcase her again in his choreographed piece. Student Choreography will be held Wednesday through Friday at 7:30 p.m. at the Fischer-Lewitsky Dance Studio (across from Bowman) on the Idyllwild Arts campus. The event is free and open to the public. But seating is limited, so you may want to arrive early. For more information, visit www.idyllwildarts.org or call (951) 659-2171.